The healthcare facilities listed in the table below have recently been awarded accreditation by The Council for Health Service Accreditation of Southern Africa (COHSASA), a not-for-profit company (NPC) based in Cape Town. A COHSASA accreditation award means the healthcare organisations have entered a rigorous quality improvement programme and have been assessed against, and comply with, standards recognised by the International Society for Quality in Health Care (ISQua), the global body overseeing accreditation and quality improvement programmes in healthcare organisations in 70 countries around the world. COHSASA itself is accredited by ISQua as are its standards. 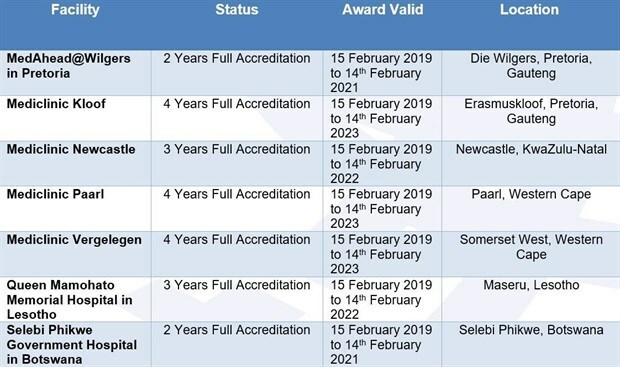 Hospitals and clinics that initially enter the programme and meet standards are awarded two-year accreditations and as the journey in excellence continues, awards of longer duration are given. A four-year accreditation award from the Council should signal to patients that a facility has sustained standards over a commendable period.